The world of fashion is known for breaking rules. Sometimes, it even breaks its own. Black is now readily seen alongside blue; tweed is for town as well as country; and double denim gets a unanimous thumbs up from the style cognoscenti. This ebb and flow of acceptability has seen many once-banished pieces make like the prodigal son, welcomed back onto runways with open arms. These are the items you should regret ejecting from your wardrobe – and swiftly replace. The city boy’s power pattern wasn’t always taboo. Favoured by menswear OGs like Cary Grant and Clark Gable, the pinstripe’s adoption in the 1980s by a certain breed of bonus-snorting banker meant sartorial banishment when the bubble burst. Now, pinstripes have re-emerged at the hands of designers like Ralph Lauren and Italy’s Lardini, as well as across the high street, thankfully without the padded shoulders or chest-covering lapels. Update yours by minding the gap – a thicker chalkstripe is less intense than its slimmer brother – or by applying it to dressed-down pieces such as blouson jackets or drawstring-waist trousers. In any case, keep the rest of your outfit muted. That means no shirts with contrast collars. It long seemed that wide-eyed ravers and deep sea trawlermen had sunk the bucket hat’s fashion fortunes, but then in stepped skate brands like Stussy and Palace, and suddenly Madchester’s favourite headwear had been given the kiss of life. Fast forward to the present day and even high-end names like Moncler and Acne are now giving the hat their own spin, showing that nothing in fashion ever truly kicks the bucket. Our advice? Avoid garish prints that will jar with smarter pieces. Instead, look for a plain version that can be worn with a laid-back shirt. Oh, and don’t actually wear it on a boat. The death knell sounded for cargo trousers around the time Limp Bizkit frontman Fred Durst pitched up in versions that could double up as a functional tent. But after a deserved time out in the menswear hinterland, designers like Brunello Cucinelli and Ami have re-introduced iterations that are slim and preppy enough to fit into everyday looks. Pair with a button-down shirt, knitted tie and blazer for an alternative to chinos, or dress down with a sweatshirt. Just keep the pockets empty to avoid that rap-rock silhouette. Minimalist trainers have had their moment, and while they’re not disappearing anytime soon, it’s maximalism that is currently flexing its muscles. Alongside joggers, the athleisure trend has seen the rise of busy, bulbous footwear styles, with reissues of OG chunky trainers Nike’s Air Max 95 and Reebok’s Insta Pump Fury, as well as the soaring popularity of the Balenciaga Triple S and Prada Cloudbust. Not one for dressing down your suit, you’re best top-to-toeing the sportswear line with a tailored tracksuit, or steering Yeezy with black, stacked denim. Corduroy has a struck an unlikely, err, chord with the fashion crowd. The old-school stuff has graduated from covering substitute teachers to become a favourite of Pitti Uomo’s best-dressed, and it’s largely thanks to the return of 1970s style. The key to not looking like a visiting professor is to realise that the tough AF fabric is solely used on dishwater brown suits, so try it on everything from shirts, to trucker jackets and even baseball caps (just, not all at once). Equally important is the wale – the distance between the ridges. The bigger the gap, the warmer the material, and the squarer your look. Stay fine to, well, stay fine. Florals made a comeback quite some summers ago, but the fact they are still going strong and continue to be important in the success of several collections earns them a place on this list. Like sandals, this particular print had to overcome an association with femininity before they could bloom in menswear. But guys have realised not only is it okay to smell like flowers — some of the best fragrances of all time use notes like iris and lavender — it’s okay to wear them, too. If you’re not ready to wear a rainbow-coloured Hawaiian shirt, opt for more subdued patterns on a dark, masculine background such as navy or black, or wear them on layering pieces like shirts that can be toned down with a jacket. We be-leaf in you. Not even Nostradamus could have predicted that the bum bag would one day rise up and spread through fashion like an aggressive rash. But it happened. Often renamed waist or cross-body bags — because who actually wants to wear something named after the lower half of one’s anatomy? 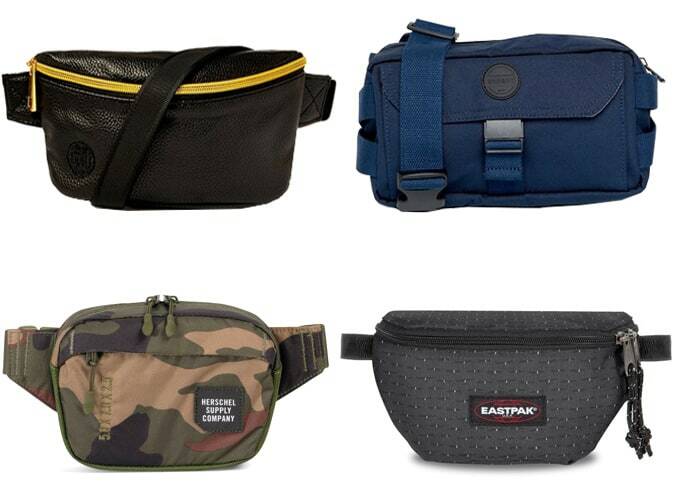 — these dorky carriers have received stylish co-signs from tastemakers like A$AP Rocky and Jared Leto. The reason for their Lazarus-like resurrection? Practicality. Sling one around your hips or across your chest to cart your kit around without weighing your pockets down. Finishing off a pair of neatly cut chinos with a short-sleeve shirt was once the fashion equivalent of cooking the perfect steak then getting your dog to do its business on top. But in the words of Bob Dylan, “the times they are a changin'”. Or, have changed, because in recent seasons bicep-skimming button ups have gone from fashion black sheep to baller menswear move. When going sans sleeve, remember to nail the fit. Too tight and you’ll look like you’re itching to talk about bicep curls. Too loose and you’ll look like Derek from IT. And no one wants to look like Derek from IT. Sorry, Derek. Get ready to get hit with a whole load of nostalgia, because baggy jeans are back in all their nineties-inspired Kriss Kross glory. Okay, maybe not that baggy. Just as guys came round to the idea of pouring themselves into jeans small enough for a schoolchild, designers began to flip-flop, turning out styles you could fit the whole class in. But bigger isn’t always better. As with tailoring, err to wide and you run the risk of looking sloppy. So opt from straight or relaxed-leg cuts rather than anything with a 40-inch hem, and keep your top half in proportion to avoid looking like a walking Weeble Wobble.